There aren't many pastimes more relaxing than a quiet day out on the boat fishing. Click here to play! Well, now you can mix your love of ocean sports with the tranquillity of playing slots in the comfort of your home. 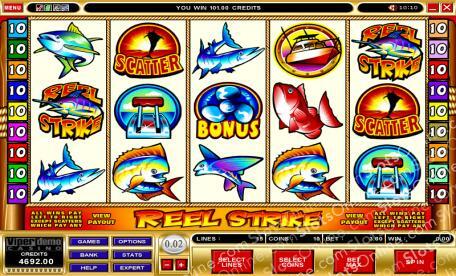 Reel Strike is a fun 5-reel slot played across 15 unique pay lines. There are 150 coins available to be played on each spin as well! The Reel is Wild and can be substituted for any other symbol on the reels except Scatter, as well as paying out up to 10,000 times your initial wager. The Fins are Bonuses and can trigger the Bonus Feature when five Bonuses appear on an active pay line. Don't forget that the Wild can substitute for a Bonus too! Reel Strike is a lucrative business if you manage to spin up the best combinations, so start winning at the fishing game today. The Marlin is Scattered and can appear anywhere on the reels to earn a payout with three or more. The Reel is Wild and can be subbed for any other symbol except Scatters. Can be subbed for Bonuses. The Bonus Round is triggered when 5 Bonus symbols appear on an active pay line. You can win Free Spins within the Bonus Round.